In the past 2 years, I’ve hosted just over 200 international travelers from 64 different countries. Whether their stay was short or long, I think every single one of them managed to visit the Walk of Fame on Hollywood Boulevard. Almost all were eager to go. A few thought it was silly, but went anyway. On return, some said it was great fun. Some were disappointed at the banality. A few thought about it as a meta-cultural critique. And the whole time, I was the local curmudgeon who thought it was all vapid and not worth visiting. And then one day Kamal from Nepal and Arimo from Finland convinced me to visit the wretched boulevard with them. I was surprised by what a compelling experience it was. So many people from across the nation and across the globe had been touched by some film or television or music that Hollywood managed to claim authorship of. Like salmon swimming upstream, the myriad visitors to The Walk of Fame may not have even fully realized why they needed to be there, but there was a deep, instinctual imperative that they had to go. Sometimes to truly see the place where you live, you need the eyes of a foreigner. 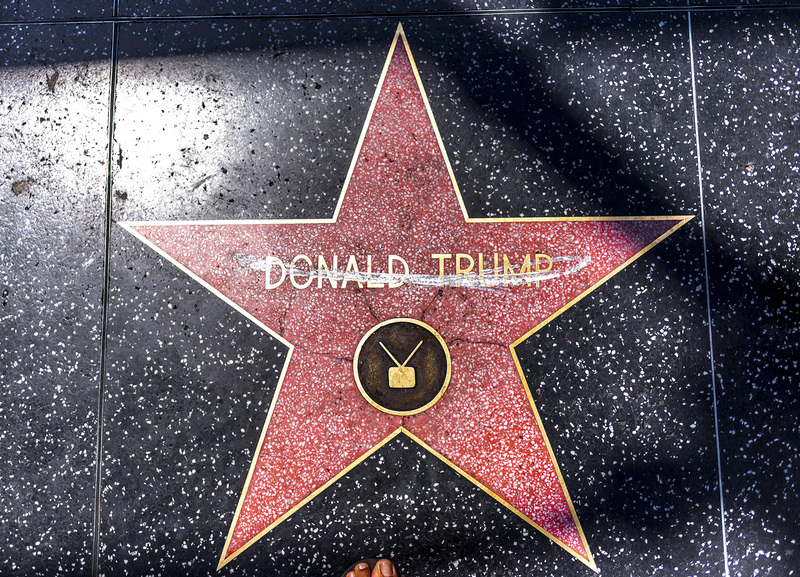 After Kamal bought us “Los Angeles” caps, Arimo used the Walk of Fame App to guide us to Donald Trump’s star on Hollywood Boulevard. It turned out that Donald Trump’s Star was right in front of the Hollywood & Highland Center. And right in front of the LA Metro Red Line’s Hollywood & Highland stop. On that day, 18 August 2017, Donald Trump’s name was crossed out with a few lines from a simple piece of chalk, or perhaps a white oil crayon. It was a political statement, but it was also simple, and understated. That day I photographed the star. 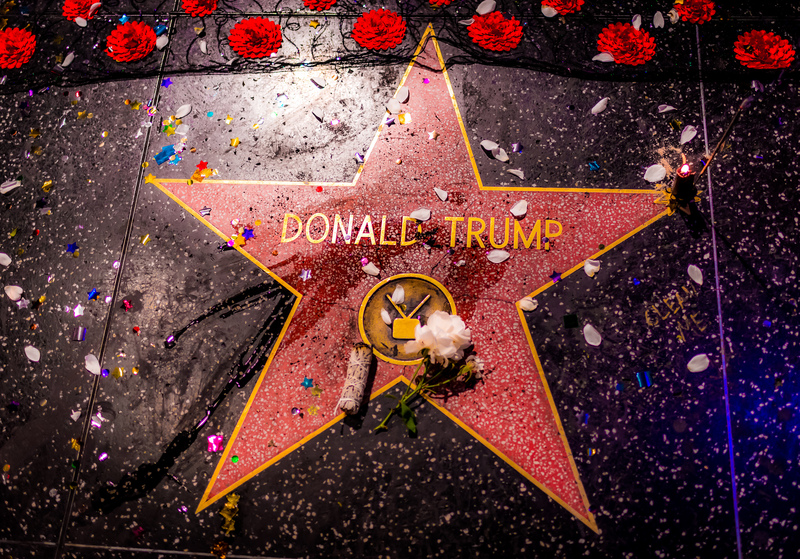 And after “boycotting” Hollywood Boulevard for 2 years, I vowed to return once every week for the next year to photograph the Trump Star. That day I was actually thinking of taking 52 close-ups of the star itself, showing it clean, or crossed out, or tagged, or whatever state I might find it in each week. I quickly realized that while the star was a powerful talisman, or water of Lourdes, or voodoo doll, that it was the people who visited it that were truly compelling. 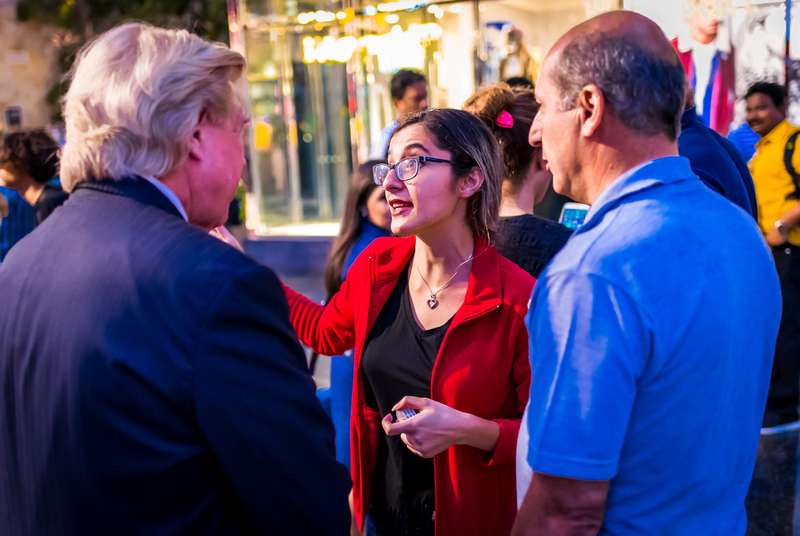 When President Trump refused to call The Persian Gulf, “The Persian Gulf,” instead referring to it as The Arabian Gulf, Los Angeles residents of Iranian descent came out to the Trump Star to protest for #persianGulfRespect. At the star they ran into a Hollywood actor who performed as a Donald Trump impersonator. Since they had no opportunity to protest the insult with the “real” President, they took the opportunity to lodge their protest with the Trump impersonator. 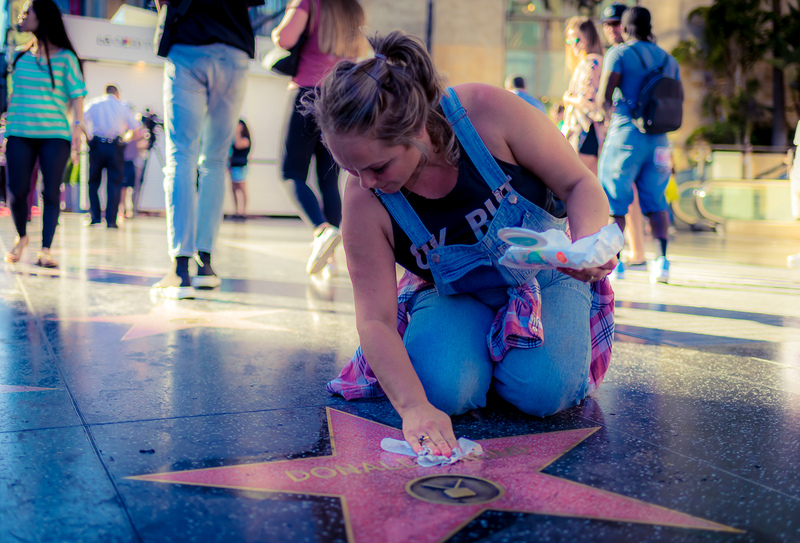 When a woman came to take a “thumbs up” selfie with the Trump Star, and found the star dirty and abused, like Mierle Laderman Ukeles before her, and Mary of Bethany before her, she got on her knees and cleaned. Many people love this President. Many people hate this President. And a lot of them come to Hollywood Boulevard to express those feelings. Donald Trump’s Star on Hollywood Boulevard. 52 Shades of Trump by Glenn Zucman is licensed under a Creative Commons Attribution 4.0 International License. Permissions beyond the scope of this license may be available at glenn.zucman.com. If you leave a comment, I won’t publish your email address. If you subscribe your email will never be sold, traded, or used for marketing in any way, it will only be used to send you occasional updates. A profound Thank You! to all the talented & generous people who have created these free & open tools that empower authors and respect freedom. Thank you to all the unnamed souls who have expressed themselves at the Trump Star. And, Thank You, for visiting.